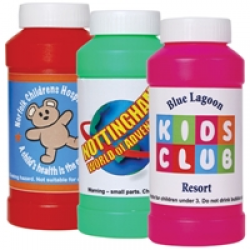 Incorporate fun in your campaigns with promotional bubbles from Promoshop! These items are great to distribute to kids and adults alike, creating enjoyment while achieving exposure for your organisation or business. Hand them out at trade shows, promotions, events and more! All designs must include safety message "NOT SUITABLE FOR CHILDREN UNDER 5. DO NOT DRINK"